Why did early human culture remain frozen? Around 3 million years ago human culture took a great leap forward when our ancestors began manufacturing stone tools. This meant they could start cutting up and eating meat, along with a whole host of other new resources. Human innovation was opening new doors for us1. For the next million years, hominins kept making the same set of tools from the same set of materials. Progress froze, despite some fairly dramatic external changes. New species emerged and spread around the world, but all the while they kept making the same set of tools2. Researchers have proposed many hypotheses over the years, but evidence remains ambiguous. However, in the past couple of years a new hypothesis has emerged that may succeed where these earlier explanations stumbled. Perhaps the explanation for the Oldowan “culture” is that it isn’t really a culture at all2. Before dealing with this new, exciting idea, it’s worth talking about what was going on 3 million years ago. It pads out my word count and gives you a bit of context on the whole thing. The first stone tools date to around 3.3 million years ago, but records are patchy at this point. With only one confirmed site, it’s hard to figure out what hominins were doing here. It looks like they were trying to break things open with rocks, then noticed that some of the debris that broke off the rocks was sharp. This was quite useful, so they started trying to deliberately manufacture such sharp flakes. About a million years later the archaeological record starts to flesh out and we start finding more tools more often. As well as the earlier sharp flakes, they also started removing them from the core in a specific manner. This shaped the core into a tool used in its own right1. The new culture of sharp flakes and other tools is called the Oldowan and continued to be made for almost a million years. After this point, some groups innovated and developed a new culture. However, others continued making the Oldowan for hundreds of thousands of years more1. When you add it all together, the Oldowan culture lasted for at least 2 million years and was manufactured by several human species. All with little change or modification2. Since the Oldowan was discovered, many have tried to explain why it persisted unchanged for so long. These have ranged from the simple (maybe it was just too easy and effective to improve), to the social (perhaps early hominin teaching was sub-par, meaning any innovation was lost between generations), to the statistical1. Although each of these ideas had some merit (after all, the Oldowan is really easy) none had accumulated enough evidence to triumph in the Thunderdome of ideas that is a scientific debate. So a new contender arrived. This latest hypothesis is based on the recent discovery of the “zone of latent solutions” in chimpanzees. The gist of this “ZLS” is that some aspects of chimp culture aren’t actually cultural. Rather, the apes are simply smart enough to independently invent certain solutions whenever they encounter a particular problem. Can’t reach something? Use a stick to scoop it! That’s not a taught or cultural skill, that’s just a smart ape figuring something out3. Humans have a similar ability of independent invention4. A chimp figuring out how to scoop. Tennie et al. (2017) suggest that perhaps the Oldowan represents something similar. It’s part of the ZLS of early humans, rather than some shared culture. 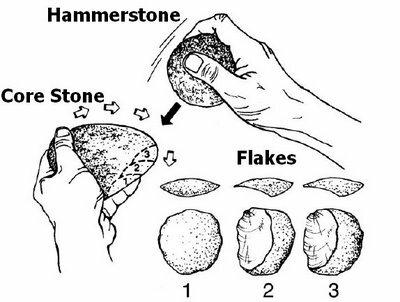 When faced with a particular problem, our ancestors each figured out that breaking rocks makes sharp flakes2. The fact that there wasn’t any teaching involved meant that any innovations would be lost between generations. Hence why the “culture” appeared to remain in stasis for so long. The secret is that it wasn’t actually a culture. Just a collection of independent discoveries by early people2. What’s perhaps most interesting about this hypothesis isn’t the idea itself, but how Tennie et al. (2017) position it. They suggest that the ZLS should be the default idea. We can’t just assume a collection of artefacts, such as the Oldowan, is a culture. We have to prove that first2. Whilst taking a step back and re-evaluating our starting assumptions can be useful, many aren’t happy with the ZLS theory. In particular, they contend that Tennie et al.’s hypothesis such a vague and overarching idea that it would be hard to prove something is actually culture2. Of course, Tennie and their colleagues haven’t taken these comments lying down and have come up with some ways they think their hypothesis could be tested. However, even they acknowledge that these tests would be difficult to carry out, given the limited evidence we have of the stone age (the clue is in the name!). Maybe someone will figure out how to carry out these tests. But in the meantime, regardless of whether you find the idea plausible, the suggestion that we should take a step back is useful. We’ve been studying these tools for close to 60 years. A fresh perspective would be handy. Toth, N. and Schick, K., 2018. An overview of the cognitive implications of the Oldowan Industrial Complex. Azania: Archaeological Research in Africa, 53(1), pp.3-39. Tennie, C., Premo, L.S., Braun, D.R. and McPherron, S.P., 2017. Early Stone Tools and Cultural Transmission: Resetting the Null Hypothesis. Current anthropology: A world journal of the sciences of man, (5), pp.652-672. Bandini, E. and Tennie, C., 2017. 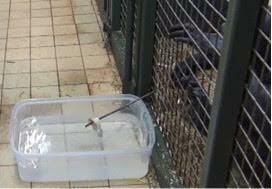 Spontaneous reoccurrence of “scooping”, a wild tool-use behaviour, in naïve chimpanzees. PeerJ, 5, p.e3814. Reindl E, Beck SR, Apperly IA, Tennie C. (2016). Young children spontaneously invent wild great apes’ tool-use behaviours. Proceedings of the Royal Society B, 283. Doi: 10.1098/rspb.2015.2402. Next post: Did going hairless help our brain evolve? Thanks for your covering of the zls hypothesis for early stone tools. One note though: our hypothesis allows for some variants social learning (it allows for a “soft” culture, if you do want) – variants that help others individually reinnovate a latent solution themselves. As a result, the frequencies of behaviours can increase with social learning, but the behaviour itself indeed isn’t passed on (explaining why it remains frozen in time). Just a small clarification. That does seem like a reasonable addition to more accurately describe what’s going on. I remember reading about a particular form of learning – whose technical name escapes me – where social circumstances can encourage experimentation and independent invention without “true” social learning happening e.g. a chimp sees another cracking a nut, which encourages them to experiment and discover how to crack nuts themselves without any direct social learning happening. That said, are you not concerned that by creating such a broad and flexible definition you’re contributing to the sense that it is an untestable concept? That it becomes infinitely harder to test, and starts running the risk of post-hoc rationalisations? Hi Adam, Very sorry, only saw your response now (somehow didnt get an email about it). You may or may not have read the chimpanzee story in one of my papers. The idea that great apes (in this case chimpanzees) are merely socially induced to power up their individual learning goes back to Wolfgang Köhler (my group has a MS in press on that topic). This insight got lost somewhat and was resurrected only relatively recently. The ZLS is the outcome of a) taking this view seriously and b) taking it to its logical conclusion (reinventions of wheels make wheels stay frozen) and c) tests that show that apes don’t, in fact, ape (imitate). They emulate, and only begin to imitate once we train them to. So, in the wild, they likely do not imitate either. I suspect your right. Someone you’ve co-authored with wrote an article here and I may well have picked up this story from them. It’s a fascinating topic and I’d be happy to host any follow-ups from you, assuming I don’t get to them first!